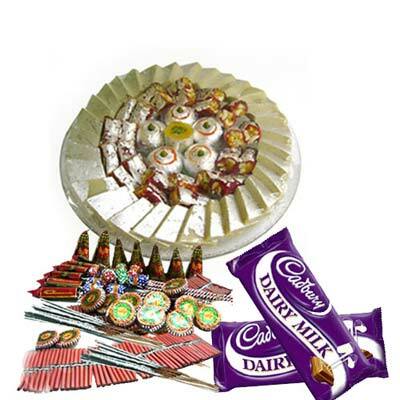 Product Consist : 2 Cadbury Dairy Milk Chocolates Bar (Weight : 13 Gms each) with Box of Assorted Sweet (Weight : 500 Gms) along with Assorted Fire crackers (Worth Rs.300/-) (Note: Types of Fire Cracker are depends upon their availability no specific choice). 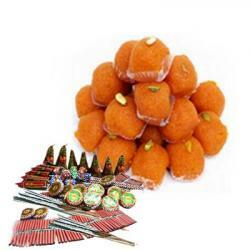 Diwali is a celebration on which sweet dishes are on their peak of demand. brings to you this awesome gift hamper which contains a packet full of four types of delicious mix sweets along with 2 bars of Cadbury dairy milk chocolate. 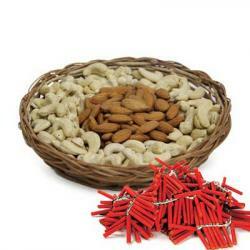 This hamper is ready to delight your dear ones with firecracker which also comes in this hamper. 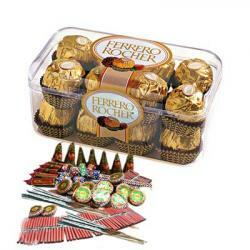 This exclusive hamper is a perfect gift for kids as the contents of this hamper are quite youthful. 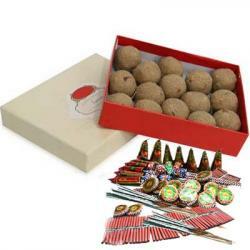 Product Includes : 2 Cadbury Dairy Milk Chocolates Bar (Weight : 13 Gms each) with Box of Assorted Sweet (Weight : 500 Gms) along with Assorted Fire crackers (Worth Rs.300/-) (Note: Types of Fire Cracker are depends upon their availability no specific choice).